My girlfriend and I just recently purchased a wonderfully preserved 2003 Outback. One owner Grandma car with only 60, 000 miles on the clock, garage kept, all maintenance records, and virtually no rust. It appears that grandma might have had a little bit of trouble seeing and there are a couple of minor scuffs in the paint, but most of them should as we say buff out. We have some mods planned, mostly with the intention to bring the car technologically up-to-date. Zedhead, eagleeye and Wiscoutback87 like this. Welcome and have fun with that Outback. If you have the 2.5 liter 4 cylinder engine, it's past due for a timing belt/idler change. Many threads here cover the subject. even with the minor parking lot dent in the fender. 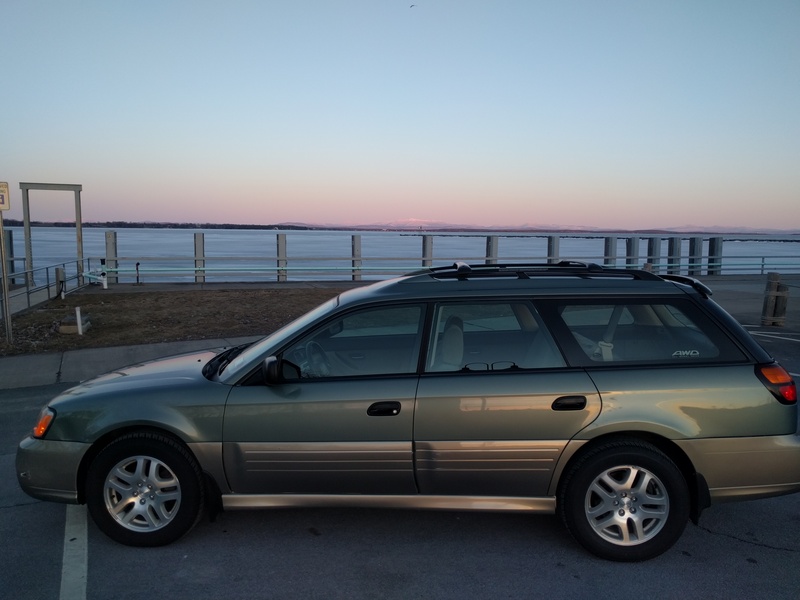 (which looks like it was backed into by another vehicle), that looks really really great for a plain jane 2003 outback. If it's a limited edit:H6 with the AUTO HVAC it should be super easy. It's all wires and one hose. Even if it doesn't reach they could easily be extended. If it's the manual 3 knob unit it's still possible but I'm not sure about the blend door cable. That would be the issue there. Plus you would still be dealing with the wiring. I never though of moving the hvac! is it on din rails or ??? Welcome, and do fill out your profile! What exactly do you mean by "technologically up-to-date"? If it's a limited with the AUTO HVAC it should be super easy. gen2 limited H4 have 3 knob. 2001-04, US spec 6 bangers including cloth have the automatic with the screen. It's just a DIN. Attaches the same way the radio does. It's just a matter if the wires and cables/hoses can reach without binding. I was thinking the same thing, not miles but how old the belt is? Also, I like adding durability to critical parts when I can due to right foot elephantiasis. At a minimum I was thinking a hp timing belt. I lost my 1st gen2 to that part letting go before its time. I was thinking something like the gates high performance one (I can't add a link because I don't have enough posts, but I found it on carID.com. Any other parts that are (or not) part of a timing belt job that I should consider going non OE?